BMB Fulmer BV is the official distributor of Amina Loudspeakers for the Benelux. Today Amina Technologies is the world’s leading designer and manufacturer of invisible speaker products. Flat panel, truly invisible plaster-over loudspeaker systems, supplying high definition sound solutions for design conscious customers who want to hear their music clearly but do not want to see their speakers! Amina stands for the easiest to install and best sounding invisible stucspeaker, allowing for highest possible quality finish, in the marketplace. BMB Fulmer BV has the distribution rights for Amina in the Benelux and has demo facilities available in their demo and training room in the Netherlands. If you want to know more about the Amina Wall of Sound please contact us, visit one of our official dealers or Amina Experience Centers. You can also come to our own Experiencer Center at our Headoffice in Utrecht. Please call 085 486 85 89 for an appointment. You are welcome! We make invisible speakers that fit directly into your wall or ceiling. Simply add a thin layer of plaster (2mm) over the top and finish with a design of your choice. Designed to be installed under plaster, wood, leather or almost anything you can imagine, Amina Technology allows you to get creative. It’s your sound, your way. Amina Invisible Speakers; no visual compromise, no sonic compromise. Amina Speakers will allow a great sounding, high fidelity audio system for any residential or high end commercial installation. Perfect for high quality distributed audio and multi-channel home cinema applications. Derived from an experiment in immersive audio by the British Ministry of Defence in the early 1980s, Vibrational Panel Technology allows a loudspeaker cone to be replaced by a flat panel. This creates a complex series of ‘tuned’ surface vibrations which generate acoustic energy. This is very similar to the way in which an acoustic musical instrument works. Unlike a conventional loudspeaker cone, VPT loudspeakers generate what is known as an incoherent-phase waveform. This means that the acoustic energy generated by the panel interacts in a summative way with the room reflections, leading to an incredibly smooth room-filling sound rather than the typical hot spots and tonal colouration associated with direct phase correlation. With a complex array of vibrations and associated incoherent-phase waveform, a VPT loudspeaker has the incredible benefit of full 180° audio dispersion. This means that whether you are stood directly underneath an Amina loudspeaker, or on the opposite side of the room, you will experience the exact same sound quality. This is unlike a conventional loudspeaker which becomes very directional at high frequencies. It is a myth that invisible loudspeakers are limited in audio performance. The general assumption is that by being positioned behind plaster or other finishing material, the speaker sounds ‘muffled’. This is just not true and has to be experienced to be believed. The loudspeaker works with the covering material to generate incredible detail and clarity. With advancements in panel materials, Amina loudspeakers can also produce incredible bass. 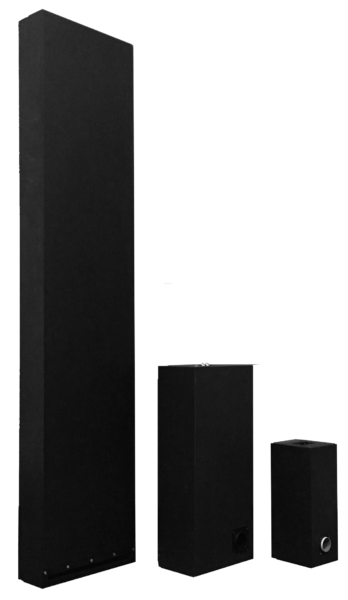 A new revolutionary design for invisible loudspeaker technology, the Edge series offers smooth low frequency extension and increased sensitivity, resulting in a dynamic and engaging listening experience that has never before been heard from an invisible loudspeaker. Building on the award- winning Evolution Series design, the Edge incorporates OptiDamping and Reduced- Resonance Exciter technology built into a plaster up-to design. The speaker uses a high quality fire-resistant panel material which allows for seamless integration into plasterboard walls and ceilings without the need for a full wet skim, all in the easy to install, lightweight form-factor that Amina is known for. Take a look at the installation video. Download Amina Edge Installation sheet here. Introducing the new Mobius invisible loudspeaker. The Mobius series pushes the sonic boundaries of what is possible with plaster-over loudspeaker technology. Whether installed behind 2mm skim of plaster, wood, synthetic veneer and many other materials, the Mobius series will allow for a great sounding, high fidelity audio system for any residential or high end commercial installation. Perfect for high quality distributed audio and multi-channel home cinema applications. Building on the award-winning Evolution Series design, the Mobius incorporates OptiDrive and OptiDamping technology as well as Reduced-Resonance Exciter technology, offering greater low frequency extension and smooth high frequency dispersion all the way to the ultrasonic region. Download Amina Mobius Installation sheet here. The iQ Developer series is the ultimate in efficient design and functionality. Introduced to meet the needs of those who want invisible audio at an attractive price point, the iQ series offers more for less. Amina discreet subwoofers are designed to be installed alongside Mobius, Evolution, iQ and LiFi speakers to provide enhanced low frequency performance and extension. Porting through a visible vent, Amina subwoofers can be installed in walls and ceilings or be built into cabinetry or furniture, giving the performance of a conventional large in-room subwoofer without having to take up valuable floor space. All subwoofers come with paintable port trims and can be further disguised by venting into shadow lines of dropped ceilings, or by being positioned under furniture. Whether you require the low frequency enhancement of the ALF40, the high power of the ALF80 or the room-shaking extension of the ALF120, Amina discreet subwoofers are perfect for any discreet low frequency application. With vibrational technology, Amina speakers are breathtakingly light. Built to last, 10 year guarantee issued on all residential speakers. Amina invisible, in-wall, plaster-over loudspeaker technology to create true invisible sound. Amina Invisible Audio Solutions: for use in residential homes, hotels, retail, pools, marine and professional environments.